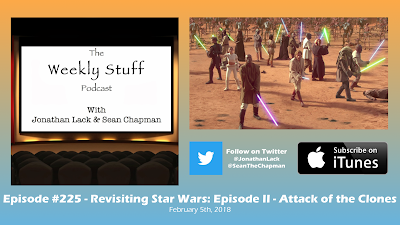 This week, we return to a galaxy far, far away for our second critical conversation about the infamous Star Wars prequels, this time diving deep with Episode II – Attack of the Clones. Perhaps the most maligned and dismissed of the Star Wars films, Attack of the Clones is, like The Phantom Menace before it, a much better film than its reputation would assert, a ‘grown-up’ Star Wars movie full of complicated ideas and nuanced character work. It also represents a major inflection point in the history of digital cinema, and remains one of the most visually stunning blockbusters ever created. Once again, this was a fun and engaging topic to record, and we think you’ll enjoy it. We also talk a little more about some recent games, including Dragon Ball FighterZ, walk through some recent gaming news, and give thoughts on all the movie trailers from Super Bowl Sunday, including our first look at Solo: A Star Wars Story.